A very wet Christmas morning did not stop thousands from taking the plunge into freezing cold waters as they started off their day with a splash at the Forty Foot in Sandycove. The annual tradition saw car park spaces at a premium from as early as 8am, as the regulars looked to get Christmas off to the freshest of starts. 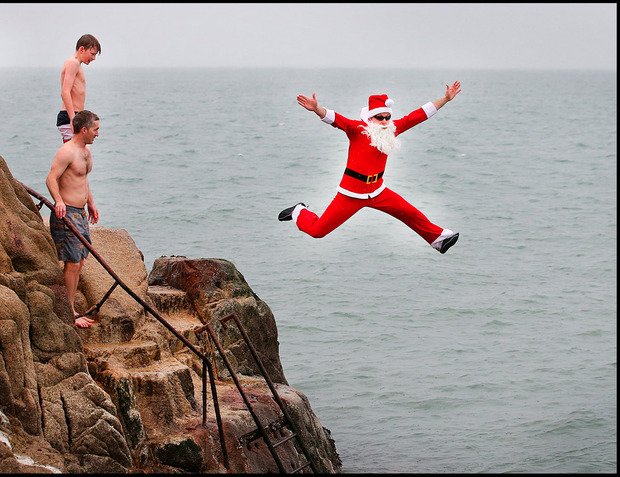 Some even arrived in their Santa costumes, while others, visiting Ireland for the first time at Christmas, were coaxed into leaping in by their new family members. Eimear Fleming (29), from Dundrum, and Brett Petersen (30) got married in May and are living in Washington. "He's from Florida, so he usually goes swimming in the gulf coast," Eimear said. Despite the cold water, her husband insisted the Irish version is a "wonderful tradition". "We're just married, it's our first Christmas in Ireland. You have to go with the traditions and do what they say basically," Brett said. Meanwhile, Santa for the day, Karl Butler (38), from Citywest, has been doing it for years, all in aid of Pieta House, with seven pals and himself raising some €600 for the cause this year. Despite what looked like difficult wet and windy conditions, he insisted it wasn't too bad. "It looks colder than it is but the tide is so low today, so you just have to watch where you're jumping," he said. "This is the eighth year in a row we're doing it for Pieta House. I've been doing it for four years in the Santa suit so I'm used to it," he added. Katie Moynihan (23) and her mum Barbara, from Killiney, were also dressed in festive gear. "This is the first year that we've dressed up for it," she said. "We haven't done it the past few years but we usually do it. We thought it'd be something different." Barry Dunne (41) and Dee Tully (39) were spotted having a kiss while swimming in the cold water. Another Christmas tradition, Barry explained. "It's a regular thing, it's our thing," he said. "It must be my 14th or 15th year out here doing this."